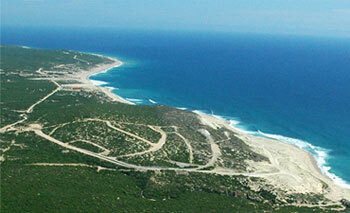 Cabo Vinorama Estates is an exclusive gated subdivision with 142 lots located on the East Cape of Baja Sur, Mexico. All of the lots boast incredible views of the Sea of Cortez and range in price from $90K to $694K. Of the 142 ocean view and beachfront lots, 43 have been sold, 52 are available and another 32 are on reserve. With access to world-class fishing, surfing, golf, diving and all the serenity of Southern Baja, Cabo Vinorama Estates is the perfect opportunity in Baja real estate for those vacationing with friends and family or those looking to make a smart investment. Construction of a new 21 mile highway from the Los Cabos International Airport to the East Cape region has recently attracted considerable attention. The highway will reduce the current 50 minute drive time to only 20 mintues. In addition, the airport route will connect to another new highway system running parallel along the Sea of Cortez linking the coastal communities. Once these roads are completed, property values on the East Cape will increase substantially. This is one of the many reasons the East Cape is poised for excellent development growth and investment return.